MATRIXSYNTH-C: Roland Oberheim – Zen and the art of Hard Disc Recording. Roland Oberheim – Zen and the art of Hard Disc Recording. 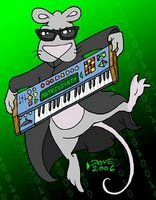 "This was all done back in 2001 with 586 Windows 98 and Soundforge, lots of editing and the only sound source was a Roland Jupiter 8 and Oberheim Xpander, hence the name :-)"